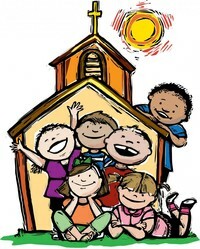 Children’s church is a place for kids to praise Jesus and learn more about Him during our 11am service! 1st-4th graders worship in the sanctuary with their parents and are then called to the back during the offertory. They proceed to their own worship experience with their teacher Monica Rodriguez and her helpers to a classroom where they learn about the Bible in an age appropriate way during the sermon and return to their parents at the end of the service. We use Children Desiring God’s curriculum focusing on Jesus one year and God's character/promises the next. We enjoy singing, praying, acting out stories, playing games, making crafts, coloring, and even doing science experiments that all relate to our monthly Bible verse!